The Coyotes and Red Wings met back on Oct. 12 in Glendale, with Detroit emerging with a 4-2 victory. 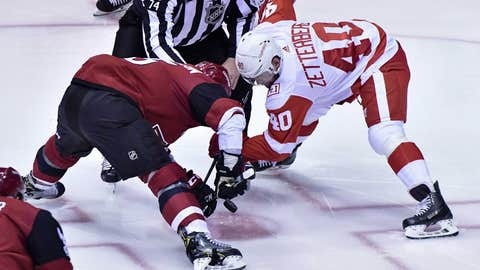 DETROIT — A pair of teams committed to youth movements meet for the second time of the young season Tuesday night when the Detroit Red Wings host the Arizona Coyotes. Two years ago, the Coyotes made a commitment to youth, opting to go with younger players and even to get youthful in the front office, where John Chayka, then 26, was hired as general manager. On their roster, the Coyotes list a dozen players 25 or younger, including a pair of teenagers, and to say there are growing pains would be an understatement. Arizona comes to Detroit with a 1-10-1 record. The Coyotes, who finally won via a 4-3 overtime decision over the Philadelphia Flyers on Monday, haven’t qualified for postseason play since reaching the Western Conference final in 2011-12. “We’re in a rut as an organization — not (just) these (12) games, but for five or six years,” Chayka told ESPN.com. “You’re trying to build up pieces that are going to be game-changers. That’s how you win. It’s not through mediocre talent or aged-out veterans. At the top of that list might be center Clayton Keller, who leads all NHL rookies in goals (eight) and points (12) but is also minus-10. 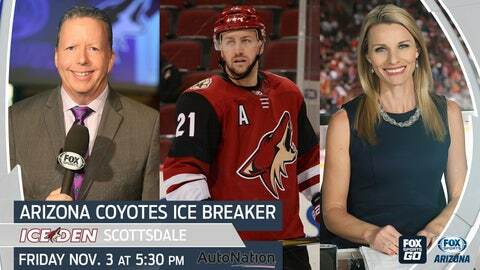 Goaltending has been another sore spot for the Coyotes. Antti Raanta, acquired from the New York Rangers to be the No. 1 netminder, is on injured reserve with a lower body injury. Louis Domingue, Raanta’s backup, was assigned to the Tucson Roadrunners after clearing waivers. He was 0-6 with a 4.33 goals-against average and an .856 save percentage. Scott Wedgewood, acquired from the New Jersey Devils on the weekend, made his Coyotes debut against the Flyers and got credit for the victory. The season is also off to a shaky start in Detroit. A 3-2 shootout win over the Florida Panthers on Saturday ended the Red Wings’ six-game losing skid. After opening the season with an impressive 4-1-0 record, including a 4-2 win over the Coyotes in Arizona on Oct. 12, Detroit is 1-5-1. Looking to find some cohesion within his club, Detroit coach Jeff Blashill indicated he planned to lock in his forward units for the next several games, assembling Dylan Larkin (age 21), Anthony Mantha (23) and Andreas Athanasiou (23) as a kid line among the Red Wings’ top six forwards. That trio combined for a goal by Athanasiou in the win at Florida. “Certainly with the three young guys together, it gives them a chance when they’re going, they can play lots,” Blashill said. “But they’ve also got to carry the line on their own a little bit as a group. Defenseman Danny DeKeyser, out the past nine games with a sprained ankle, won’t be back in the Detroit lineup anytime soon. DeKeyser is being shut down for a week to allow his ankle to fully heal. “As he was progressing, as we ramped up to more live battle level, and all of a sudden it started to hurt him more,” Blashill said Monday. “We re-evaluated today and docs want to hold him out a week and then see where it’s at right now.